Now, the ad is truthful in that Halter, indeed, appears to have said that he'd support a balanced package of tax increases and benefit reductions to fix Social Security. That said, the only way to fix Social Security is either through tax increases or benefit reductions, so it's not as if Halter went out on a limb here – all he said was that he'd do a bit of each. Lincoln's promises at the end – she won't privatize Social Security and she won't cut benefits – obviously leaves out any pledge on the tax part. So I guess Halter could respond that Lincoln has pledged to fix Social Security 100 percent by raising taxes and then outline how big a tax increase that would be (pretty big). This is all pretty stupid stuff. But given that demogoguing Social Security is pretty much the Democratic Party's stock in trade, it's hard for me to feel too sorry for any of them. You reap what you sow, I guess. Indexing the normal retirement age (NRA) for increases in life expectancy. Providing for special transfers to the General Fund of the Treasury that would offset any prior General Revenue transfers as long as trust fund solvency is maintained. Reducing basic Social Security retired worker benefits of individual account participants and any Social Security aged survivor or aged spouse benefits paid as auxiliary benefits of individual account participants, with the reduction reflecting the degree of participation over their entire career. Providing that each worker participating in the PSA would be guaranteed that the account balance, as of the month prior to the month that the annuity begins, would be at least as large as the participant's total contributions accumulated with increases in the Consumer Price Index for Urban Wage Earners and Clerical Workers (CPI-W). Put in simple terms, Rep. Ryan's plan would make Social Security solvent over the next 75 years, with the expectation of remaining solvent thereafter – so-called "sustainable solvency." The plan would use general tax revenues to cover costs for a period of around 20 years, but these transfers could be repaid, plus interest in the following two decades. Whether you like the plan's basic outlines or not, the fact remains that very few Members of Congress from either party have been willing to put pen to paper to show how they would make Social Security solvent. The fact that Congressman Ryan has been willing to do this not simply with Social Security but also with Medicare and Medicaid, as well as to propose reforms to the tax code and to private sector health care, shows a rare level of courage and policy ambition. The whole actuarial memo is available here. What drives the long-term budget deficit -- spending increases or falling taxes? Find the answer over at AEI's online magazine, The American. Using the Social Security Administration's MINT (Modeling Income in the Near Term) model, this paper calculates the marginal returns to work near retirement, as measured by the increase in benefits associated with an additional year of employment at the end of an individual's work life. With exceptions for certain population subgroups, the analysis finds that marginal returns on Social Security taxes paid near retirement are generally low. The paper also tests the effects on marginal returns of a variety of potential Social Security policy changes designed to improve incentives to work. But I recommend heading over to SSA's research pages, since there's a lot of great material by their whole team of researchers available there. Social Security: Taxes or Contributions? April 15th is a day we contemplate our financial relationship to government. It thus provides a suitable occasion to reflect on the distinction between Social Security contributions and income taxes. In discussions of Social Security, many disagreements stem from the fact that we view its funding from within different paradigms, namely some of us see these payments as insurance contributions, others as just another form of income tax. On this year's Tax Day, this post considers the historical origins of this conceptual distinction, arguments for each of the two paradigms, and their implications for strategies of fiscal reform. Personally, I don't think it's either/or, and in fact we can also break down the Social Security payment into both a contribution and a tax component (meaning, the contribution you get back while the tax you don't; the tax part is a result of early Social Security participants getting back far more in benefits than they paid in taxes, meaning that future participants would experience the opposite). In addition, you could break down the contribution component into a pure contribution – meaning, something you personal can expect to receive back – and an insurance premium, which you would receive back only under certain circumstances (disability, death, low lifetime earnings). So really there may be three aspects to what at first glance appears to be a simple tax. Lincoln has criticized Halter for supporting the Clinton administration's plan to invest part of the Social Security trust fund in stocks. While that would have retained the defined benefit character of Social Security it would also have subjected the program's ability to pay future benefits to fluctuations in the stock market, which was a key Democratic criticism of President Bush's plans for Social Security reform including personal accounts. Halter has criticized Lincoln for, at some points at least, seeming open-minded about personal accounts, though the Lincoln quotes I've seen to date hardly seem incriminating in that regard (to the degree you view support for accounts as a crime, which I don't, but then I don't vote in Democratic primaries). I don't know that much regarding Lincoln's true stance, but I had always seen her as an "add on" person, who would favor supplemental savings accounts not funded through the Social Security tax. Far be it for me to cast judgment, but it seems that neither Halter nor Lincoln really supported what we'd call "privatization." (I long ago wondered what the left really meant by privatization, in any case.) But if they want to spend their time talking about past positions rather than what we should do now, that's up to them. The Mercatus Center's Veronique de Rugy compares CBO's latest projections of Social Security's income and cost rates to those it made in 2008. What's interesting is how long it takes to recover from a short-term hit to program finances. "The thing to bear in mind is that overall, the US tax system isn't actually that progressive: the payroll tax is regressive, as are most state and local taxes, which largely offsets the progressivity of the income tax." I'll limit myself here to payroll taxes. (It's not clear to me that state income and property taxes are regressive, although sales taxes are.) 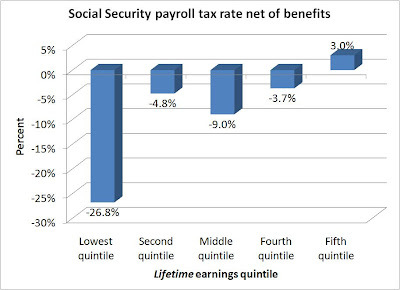 Social Security taxes, as Krugman may or may not be aware, fund a thing known as Social Security benefits. Analysts of this system consider them together in order to determine whether the program is or isn't progressive. One way they do it is by calculating what's called the "net tax rate"—that is, the statutory 12.4 percent Social Security tax paid by workers minus the benefits they receive from the program. If you receive benefits equal to your taxes, then your net tax rate is zero. If you pay more in taxes than you receive in benefits, your net tax rate is positive; likewise, if you receive more benefits than taxes your net tax rate is negative. This chart, which I calculated using the Policy Simulation Group's GEMINI model, reports net tax rates for recent retirees, broken down by quintiles of lifetime earnings. What it shows is that the highest-earning 20 percent of individuals—the fifth quintile—pay a positive net tax rate of 3 percent of lifetime earnings. The other 80 percent pay negative net tax rates, meaning that they tend to receive more in benefits than they receive in taxes. (For anyone looking forward to this in the future, just bear in mind that the program is insolvent.) The lowest-earning fifth of the population has a negative net tax rate of almost 27 percent, which implies that they receive far, far more from Social Security than they pay into the program. Call me picky, but what I'd like to see from tenured Ivy League professors and Nobel Prize winners is that it takes more than, oh, 30 seconds to figure out the obvious flaw in their arguments. Maybe next time. Here's another way to put it: if we're looking at Social Security taxes and benefits in isolation, then yes, Social Security taxes are regressive. But then, Social Security benefits would have to be considered a form of welfare, rather than earned social insurance. The key to the program from FDR's time, I've argued, was that there was some link between the two. If so, we should think about them in those terms. I wish I could do these kinds of graphics things, but since I obviously can't you should check out Mish's site. The Cato Institute 1000 Massachusetts Ave, NW, Washington, D.C.
[Directions to CATO], at 8:30am. Cato Institute senior fellow Jagadeesh Gokhale will talk about his new book "Social Security: A Fresh Look At Policy Alternatives." Many of us suspect that Social Security faces eventual bankruptcy. But the government projects its future finances using outdated methods. Employing a more up-to-date approach, Jagadeesh Gokhale here argues that the program faces insolvency far sooner than previously thought. To assess Social Security's fate more accurately under current and alternative policies, Gokhale constructs a detailed simulation of the forces shaping American demographics and the economy to project their future evolution. He then uses this simulation to analyze six prominent Social Security reform packages - two liberal, two centrist, and two conservative - to demonstrate how far they would restore the program's financial health and which population groups would be helped or hurt in the process. Arguments over Social Security have raged for decades, but they have taken place in a relative informational vacuum; "Social Security" provides the necessary bedrock of analysis that will prove vital for anyone with a stake in this important debate. If you plan on coming please RSVP. Coffee, juice, and pastries will be served. Please feel free to pass this along to others who you feel might be interested in attending. Blogger's note: Jagadeesh's book has some very interesting insights about whether current projections of Social Security's finances are really catching what the future will look like, and whether existing reforms plans will be enough to bring the program back to solvency. An event well worth attending. U.S. Senate candidate Marco Rubio deserves credit for candidly confronting the challenge to keep Social Security solvent. The Miami Republican calls for raising the retirement age and says he's willing to consider recalculating cost of living adjustments. Those are the sorts of straight answers Floridians deserve from serious candidates. A recent debate on "Fox News Sunday" illustrated the differences between the few politicians who are, and the many who are not, willing to face facts. Marco Rubio, the former speaker of Florida's House of Representatives who is challenging Gov. Charles Crist for the Republican U.S. Senate nomination, made news by stating the obvious. Asked how the nation might address the projected $17.5 trillion in unfunded Social Security liabilities, Rubio said that we should consider two changes for people 10 or more years from retirement. One would raise the retirement age. The other would alter the calculation of benefits: Indexing them to inflation rather than wage increases would substantially reduce the system's unfunded liabilities. Neither idea startles any serious person. But Crist, with the reflex of the unreflective, rejected both and said that he would fix Social Security by eliminating "waste" and "fraud," of which there is little. The system's problems are the result not of incompetent administration but of improvident promises made by Congress. What's interesting about all this is how interesting it shouldn't be: I'm not aware that Rubio set out to be a Social Security reformer; rather, he simply answered a question that most politicians prefer to dodge. Of course Social Security needs to be fixed, and of course it's going to demand some hard choices regarding taxes, benefits, the retirement age or other provisions. What makes Rubio's straightforward answer unusual is that we've gotten so used to aspiring politicians dodging these questions. "Any expert from any political spectrum will tell you that Rubio was right," said Andrew Biggs, former No. 2 at the Social Security Administration and now with the conservative American Enterprise Institute for Public Policy Research. By which I meant not merely raising the retirement age, but the broader need for significant changes, be it changing the formula for Cost of Living Adjustments (COLAs), reducing benefits, raising taxes, etc. The problem with Crist's claim, which he surely knows now if he didn't know it then, is that Social Security is a very efficient program, by government standards at least. Social Security knows your age and it knows your earnings, so when you show up at the SSA office – or, my former colleagues there will scream at me to point out, do it online – the program simply calculates a benefit and cuts you a check. You're not going to fill a $15 trillion gap by cutting waste in this process. There is room to cut waste in the disability program, where an alarming number of applicants have ailments – particularly back pain and depression – that are notoriously difficult to prove or disprove. Tightening eligibility standards, which were loosened by Congress in the 1980s, would improve solvency while maintaining benefits for the truly disabled. But somehow I suspect Crist won't be targeting the disability program, either. The core issue is whether, as entitlements grow and debt rises, candidates for public office will have the courage to speak to us as adults about the difficult choices we face. Rubio showed that courage, while Crist did not. Disability insolvency in 2018 – what will Congress do? Investors Business Daily's Jed Graham reports on a seemingly small but important fact: Social Security's Old and Survivors (OASI) program is legally distinct from its Disability Insurance (DI) program, even if their finances are generally lumped together. The DI program is in far worse financial shape than OASI, such that its trust fund is currently projected to be exhausted in 2018. At that point, Congress must do something to keep checks flowing, even if that something is merely to allow for cross subsidization between the OASI and DI trust funds. It would be nice, though, if we looked at real reforms. On one hand, I'm more open to tax increases for disability than retirement, since on the retirement end people can easily "tax themselves" simply by saving more. That's tougher to do with regarding to private disability insurance. At the same time, though, I'm worried about the increase in disability applicants coming from categories – particularly depression and musculoskeletal problems (read: back pain) – that are hard for SSA to confirm or disprove. My trade-off would be to allow for some higher taxes in exchange for tightened eligibility, but it's hard to predict whether Congress can make the tough choices. Not Social Security-related, but since it draws a bit on my work on state pension liabilities relative to state debt, this might be of interest. Cato's Chris Edwards runs a simple regression of the share of the state government workforce that is unionized on the state's debt/GDP ratio. As it turns out, the relationship is pretty significant. Chris has a backstory on how it would play out, although I think it's also possible that a third variable drives both. Worth checking out in any case. WASHINGTON — The Obama administration is delaying release of the annual report on the financial health of Social Security and Medicare so that the new report can reflect the impact of the recently passed health care overhaul. The official, who spoke on condition of anonymity before the formal announcement, said Monday that the delay will allow the government to determine the impact of the massive overhaul of health care that President Barack Obama just signed into law. In January, Richard Foster, the chief actuary for Medicare, estimated that the Senate bill which passed on Christmas eve would extend the life of the Medicare hospital trust fund by 10 years. The legislation that finally passed Congress was the Senate bill but with revisions approved to win House support. The trustees warned that the financial pressures would begin much sooner when the programs begin paying out more in benefits each year than they collect in taxes. Officials with the Congressional Budget Office say that Social Security will start paying more in benefits than it collects in payroll taxes this year for the first time since the 1980s. Supporters of the new health care overhaul believe it will have a favorable impact on both Medicare and Social Security, extending the life of both trust funds. The benefits would occur in large part through lowering health costs by expanding the pool of people buying insurance coverage. For Medicare, that would result in a direct benefit in lower medical bills while the boost to Social Security would occur in an indirect way. If employers see their costs for health insurance fall, they would have more money to spend on employee salaries. Higher salaries would mean a larger amount of wages that would be subject to the Social Security payroll tax. This year's trustees report would represent the most authoritative estimate on the impact those changes will have on both Medicare and Social Security. The report will also estimate the impact the health care overhaul will have on the premiums that Medicare recipients must pay. Supporters of the overhaul believe those premium costs will fall. The estimate that Social Security will pay out more in benefits this year than it collects in taxes is based on budget data produced by the nonpartisan Congressional Budget Office. The CBO projects that because of a recession that cut the number of people working and paying payroll taxes, Social Security will be paying out more in benefits this year and for the next three years. CBO analysts see Social Security returning to small surpluses in 2014 and 2015 before returning to indefinite deficits starting in 2016 under the impact of a rising number of the 78 million baby boomers retiring. Discussing the Manhattan Institute's New Report: "Underfunded Teacher Pension Plans: It's Worse Than You Think." From New Jersey to California, public employee pension funds are woefully underfunded. Quite simply, the assets in these funds' portfolios are failing to appreciate at the rate the funds' managers assumed they would. If public employee pension funds used the same assumptions as private sector plans, the aggregate estimates of unfunded liabilities would more than double, from approximately $332 billion to $933 billion. Unless it is addressed, this gap between pensions' payment obligations and their investment assets will result in tax increases and cuts in services—a phenomenon already happening in some states. States that do not take quick action to fix their pension imbalance will see this problem only get worse. In their new report for the Manhattan Institute, authors Barro and Buck show that, while states must deal with accrued liabilities, several options exist to rein in out of control public pensions and avoid future funding shortfalls. To RSVP, please call 646-839-3372 or visit www.manhattan-institute.org/events/cci_04-13-10.htm. Saturday morning I appeared on C-SPAN's Washington Journal with Christian Weller of the Center for American Progress to talk about the deficit, the debt and that sort of stuff. It was a good discussion. Click here to check it out. Yesterday I spoke at an event sponsored by the Concord Coalition in conjunction with Rep. Steny Hoyer concerning the budget and entitlement situation going forward. In addition to Rep. Hoyer, the speakers included Concord's Bob Bixby, the Peterson Foundation's David Walker, former AARP CEO Bill Novelli, and, well, me. Unfortunately I can't embed the video, but it's available here. I thought it was a good event. The very useful CBO director's blog has a nice post about the state of Social Security's finances, which have gotten some publicity lately due to CBO's projection that the program will run an almost $30 billion cash deficit this year. Director Elmendorf gives a good explanation of what's going on, what's driving the changes, and what they do and don't mean for the program. The balances credited to the trust funds are a measure of the government's legal authority to pay Social Security benefits, but the resources to redeem government bonds in the trust funds and thereby pay for benefits in some future year will have to be generated from taxes, other government income, or government borrowing in that year.